AUSTIN, TX -- When you ask a golfer if they remember a particular hole on a course, more often than not they recall a certain par 3. Generally, the reason for such selective memory is a result of the hole's beauty, its challenge, and to a lesser extent, the player's success on the hole. Success aside, appearance and overall test are at the core of what makes a par 3 memorable. 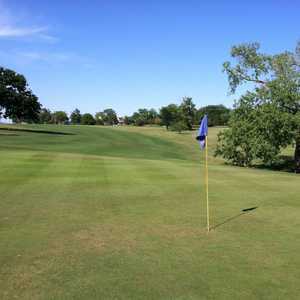 With more than 50 courses throughout Central Texas and courses as diverse as the landscape, there are quite a few par 3s in the area that rank at or near the top in the state and consequently are unforgettable. So where are the most memorable par 3s and why? In Austin proper there are a couple of par 3s that make the list. Like any good par 3, No. 17, features both elements. The beauty is apparent in the 180 yards of water that lies between the tee and green. It's also that same water that provides a considerable test. However, don't think you can just pull out a long iron or wood and blast your ball over the water. Being long on this hole can wreak havoc on your score as several mounds protect the back portion of the putting surface with tall grass lurking behind, making a chip shot very difficult. Throw in the fact that wind speed and direction can fluctuate from each swing of the club, and you have a very challenging hole. Despite all the challenges, Jeff Wilson, who is the head professional at Bluebonnet Hill, said the green is receptive. "On a quality par 3, the green has to have a receptive feel to it. No. 17 has that. What does that is the surrounding terrain of the entire green complex." The 187-yard hole at one of Austin's oldest public courses has all the ingredients of a quality par 3. The eye-catching hole features a drop in elevation of approximately 50 feet from tee to green and features a small pond in front of the green. Today, the test is judging the wind speed and direction well enough to clear the water and successfully land on the green. In the not-so-distant-past, an additional challenge was overcoming the roar of arriving or departing airplanes, as the par 3 was located directly in the path of air traffic at the former Robert Mueller airport. 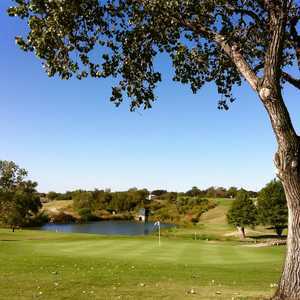 Austin's newest course features a par 3 that we recognize as one of the top par 3s in the area and will eventually get recognized by those who play it. No. 13 fits the bill of a top par 3. Although it doesn't feature water as prominently or a spectacular drop in elevation like some of the other holes, it does include trees and some water. Water on this hole is located to the right but is not a focus when you tee it up as it is somewhat disguised by a line of trees and shrubbery. The green is framed by a canopy of towering oaks behind the hole and a rim rock feature to the right. To the left, it includes what Roy Kizer and Jimmy Clay head professional Kevin Gomillion describes as a crucial element to a good par 3 - a bailout area. "One side of every par 3 needs to have some type of hazard. But every player needs an area to bailout," Gomillion said. "You don't want to be miserable." He said that means any hole with trouble on all sides does not rate high on his list. Although the immediate Austin area does have its share of quality par 3s, the surrounding area is not in short supply of quality holes of the short variety. To the east of Austin is one of the more spectacular par 3s the area has to offer. While 191 yards is the yardage listed on this hole, 120 is the number most often talked about as it is the number of feet the green is located below the tee box. This drop in elevation produces several challenges with the wind - direction and speed - as well as depth perception. "You can punch it and keep it low and go at the hole or you can throttle back and launch a shot up in the air and risk the wind affecting the ball flight," said ColoVista head professional Moore McDonough. The drop in elevation and the Colorado River in the background offer one of the more stunning golf course views in the state. "It's just spectacular," said Wilson. To the west of Austin is a par 3 that can only be described as beautiful. The hole features a large tee box for a variety of distances to hit across the small pond and avoid the creek that runs down the entire left side of the hole. In back of the green is a cascading waterfall that stands approximately 50 feet tall. After you have made it to the green, all that can be heard is the sound of water running next to the green and cascading down the waterfall. No. 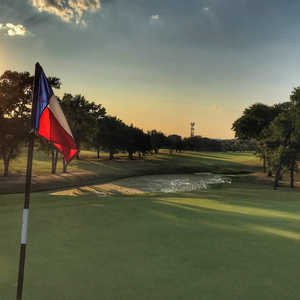 11 is the signature hole of Palmer-Lakeside and it has ranked as one of "The 18 Most Beautiful Holes (In Texas)" according to the Dallas Morning News. "That is easily one of the most beautiful holes in the state," Wilson said. The final par 3 is located at Crystal Falls, one of the smaller and less publicized courses in Central Texas that is located approximately 25 miles northwest of Austin in the Texas Hill Country. This location and subsequent topography allowed for the creation of a stunning hole. When you step on to this tee box, you cannot help but enjoy the incredible vistas that overlook miles of the rolling terrain known as the Texas Hill Country. Once your ball is teed up, the beauty fades to the background and the treachery that lies ahead takes center stage. The danger is not only in judging how to maneuver your ball down the approximate 200-foot drop to the green, but doing so while trying to avoid the surrounding mounds located on three sides of the green. Like most of the par 3s, take wind speed and direction into consideration.